SLAVYANSK, Ukraine -- The rebel leader spread a topographic map in front of a closed grocery store here as a Ukrainian military helicopter flew past a nearby hill. Ukrainian troops had just seized positions along a river, about a mile and a half away. The commander thought they might advance. He issued orders with the authority of a man who had seen many battles. “Go down to the bridge and set up the snipers,” the leader, who gave only a first name, Yuri, said to a former Ukrainian paratrooper, who jogged away. Yuri commands the 12th Company, part of the self-proclaimed People’s Militia of the Donetsk People’s Republic, a previously unknown and often masked rebel force that since early April has seized government buildings in eastern Ukraine and, until Saturday, held prisoner a team of European military observers it accused of being NATO spies. His is one of the faces behind the shadowy paramilitary takeover. But even with his mask off, much about his aims, motivations and connections remains murky, illustrating why this expanding conflict is still so complex. Yuri, who appears to be in his mid-50s, is in many ways an ordinary eastern Ukrainian of his generation. A military veteran, he survived the Soviet collapse to own a small construction business in Druzhkovka, about 15 miles south of here. He is also a former Soviet special forces commander who served in Afghanistan, a background that could make him both authentically local and a capable Kremlin proxy. In this war, clouded by competing claims on both sides, one persistent mystery has been the identity and affiliations of the militiamen, who have pressed the confrontation between Russia and the West into its latest bitter phase. Moscow says they are Ukrainians and not part of the Russian armed forces, as the so-called green men in Crimea turned out to be. Western officials and the Ukrainian government insist that Russians have led, organized and equipped the fighters. A deeper look at the 12th Company — during more than a week of visiting its checkpoints, interviewing its fighters and observing them in action against a Ukrainian military advance here on Friday — shows that in its case neither portrayal captures the full story. The rebels of the 12th Company appear to be Ukrainians but, like many in the region, have deep ties to and affinity for Russia. They are veterans of the Soviet, Ukrainian or Russian Armies, and some have families on the other side of the border. Theirs is a tangled mix of identities and loyalties. Further complicating the picture, while the fighters share a passionate distrust of Ukraine’s government and the Western powers that support it, they disagree among themselves about their ultimate goals. They argue about whether Ukraine should redistribute power via greater federalization or whether the region should be annexed by Russia, and they harbor different views about which side might claim Kiev, the capital, and even about where the border of a divided Ukraine might lie. Yuri speaks with ambivalence about the possibility of Russian annexation, even as Russia’s tri-colored flag fluttered beside the porch where he directed his troops. He says he participated in the seizure of Ukraine’s intelligence service building in Donetsk on April 7 and led the capture of this city’s police building five days later, twin operations that helped establish the militia’s foothold. Videos and photographs of the second attack confirm his story. Throughout the week, as Ukrainian soldiers sometimes pressed closer, he chuckled at the claims by officials in Kiev and the West that his operations had been guided by Russian military intelligence officers. There is no Russian master, he said. “We have no Muscovites here,” he said. That experience, he and his fighters say, includes four years as a Soviet small-unit commander in Kandahar, Afghanistan, in the 1980s. The 119 fighters he said he leads, who appear to range in age from their 20s to their 50s, all speak of prior service in Soviet or Ukrainian infantry, airborne, special forces or air-defense units. One, Kostya, served in the post-Soviet Russian Army, where he was a paratrooper. But he too claimed Ukrainian citizenship, which he said he received two years ago after moving to the Donetsk region in 1997 to live near his mother. Two others said they were from outside eastern Ukraine, one from Odessa, in the south, and the other from Dnipropetrovsk, in the center. 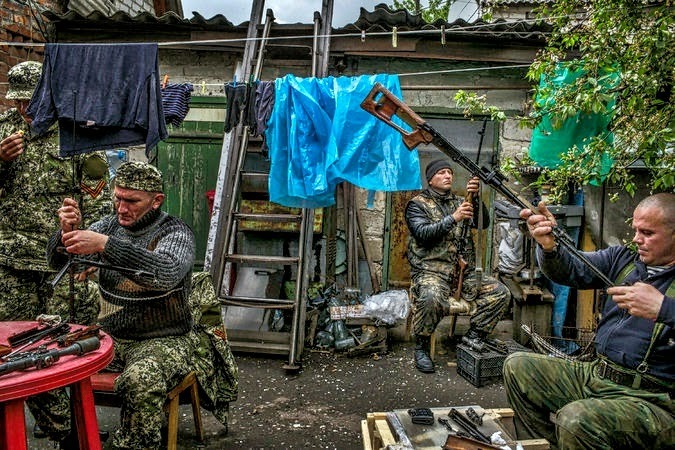 For now, the 12th Company forms part of the front lines in Slavyansk, where its fighters stand at barricades facing the Ukrainian military, with whom the militia has clashed several times. The company’s members wear masks on patrols, which crisscross the city around the clock. They show signs of discipline, including organizing rotating watches at checkpoints, frequently cleaning their weapons and abstaining from alcohol. And they claim to have a sprawling network of informers who warn them of Ukrainian military actions as they begin. All spoke of disgust with the interim authorities in Kiev, who came to power after chasing President Viktor F. Yanukovych from office in February. They bristled at any suggestion that their seizure of government buildings was wrong. Pro-Western protesters in Kiev have held government buildings and the city’s main square since last fall, they said. “Why did America support those acts, but is in opposition to ours?” said Maksim, the young former paratrooper who organized Yuri’s snipers by the bridge. “These are the contradictions of the West.” Maksim, like many others, speaks of what he sees as unbreakable cultural, economic and religious ties to Russia and his ideal of a greater Slavic world, which he says is threatened from outside. The threats, the fighters said, were made clear by a parliamentary proposal in February by the interim authorities in Kiev that would have stripped Russian of its status as an official language in eastern Ukraine. The proposal was vetoed by the interim president, but in the fighters’ view the episode signaled an official cultural assault. “That was a turning point,” said Maksim, adjusting a knife tucked against his chest in a black vest. Several fighters shook their heads at the idea that they had been paid by Russia, by oligarchs or by anybody else. “This is not a job,” said one fighter, Dmitry. Moreover, if Russia’s intelligence services had been helping them, they said, they would have new weapons, not the dated arms visible at their checkpoints and stored in the base where they sleep. During the fighting on Friday, two of the fighters carried hunting shotguns, and the heaviest visible weapon was a sole rocket-propelled grenade. Much of their stock was identical to the weapons seen in the hands of Ukrainian soldiers and Interior Ministry special forces troops at government positions outside the city. These included 9-millimeter Makarov pistols, Kalashnikov assault rifles and a few Dragunov sniper rifles, RPK light machine guns and portable antitank rockets, including some with production stamps from the 1980s and early 1990s. Many of the weapons show signs of long service. One, an RPG-7 launcher, looked clean and fresh. The fighters claim it had been purchased from Ukrainian soldiers for $2,000, along with 12 high-explosive projectiles. Militia members said their weapons had either been taken from seized police buildings and a column of captured Ukrainian armored vehicles, or bought from corrupt Ukrainian soldiers. There was no clear Russian link in the 12th Company’s arsenal, but it was not possible to confirm the rebels’ descriptions of the sources of their money and equipment. There were, however, indicators of local support. One afternoon, a crowd labored to build a barricade and a bunker beside a bridge over a canal to the city’s west. At the 12th Company’s main base, the home of Tanya and her husband, Lev, residents visited to donate food: homemade pastries, slabs of salted pork fat, a vat of borscht, bags of fresh green onions, jars of pickled vegetables and fruits. “To the guys in Kiev, we are separatists and terrorists,” Yuri said. Tanya, 60, who offered to feed the rebels after her son joined them last month, has assumed the role of company cook. She keeps the table behind the house stacked with food and admonishes the men to eat more whenever they leave bowls of borscht unfinished. The couple’s garage has become a barracks; a shed is now an armory. Camouflage hangs on lines strung from cherry trees. The militia claims to have mostly good relations with the local police, who have done little to stop them. Many police officers still patrol in rebel territory, accepting the militia’s authority while directing traffic or investigating accidents. Where these militiamen and their backers are trying to steer Ukraine remains a matter of dispute even among the men wearing masks. In the 12th Company, some hope the eastern provinces can establish autonomy within a federalized Ukraine. Others speak of dividing the nation in two, with much of it joining Russia. “No, no, no,” interjected Dmitry, a younger fighter. Later, another fighter, Aleksey, agreed. “In western Ukraine, they showed their faces: Nazis, fascist,” he said. Then came the matter of details, where might a new border be, and which side should keep Kiev. “Let Kiev remain there in the west,” said Sanya, a huge man with a shaved head who carried a Dragunov sniper rifle. “No, all the way to Kiev!” Dmitry said. Alexey proposed a border along the Dnieper, the river that runs through Kiev. “Fine, along the Dnieper,” Dmitry said. “Left bank is theirs, right bank is ours.” Whatever the final shape, Yuri said later, Ukraine’s interim government must allow a vote or face civil war. “Either a sea of blood and corpses, or a referendum,” he said.